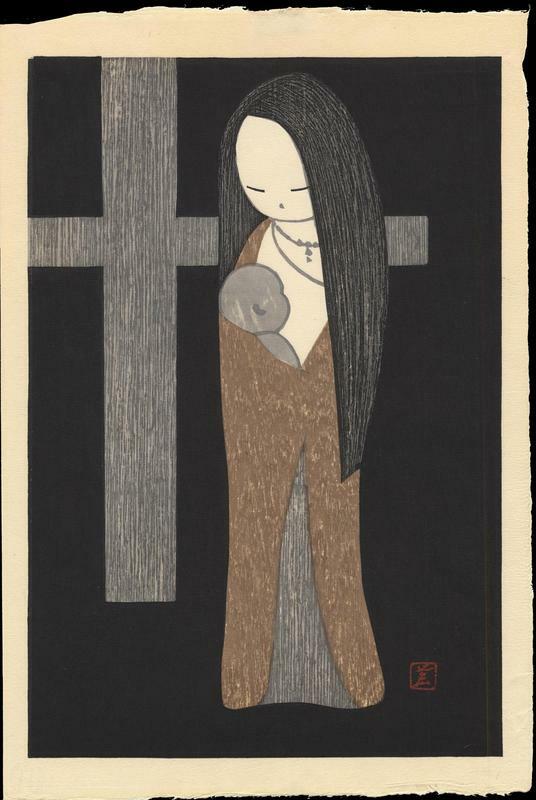 Kawano, Kaoru (1916-1965) "Maria Kwannon" - Woodblock - Chinese and Japanese woodblock prints for sale, silkscreen, scrolls, watercolor, lithographs. Artwork Details for Kawano, Kaoru (1916-1965) "Maria Kwannon"
Condition: Pristine; Kawano round seal on verso; remnants of tape verso top margin. The brown vertical line at the lower right of the image area is a scanner artefact; it does not appear on the print. Notes: Red Kawano seal within image area at lower right.